The Andromeda Strain (2008), released on DVD this week, is the second version of Michael Crichton's 1969 novel put on film. Having just premiered on A&E on Memorial Day, I was looking forward to seeing an updated adaptation. The first time it was adapted to screen by directing great Robert Wise, it was very popular and suspenseful. 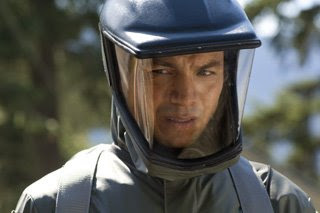 Tracking the analysis, identification, and attempt to contain a virus from space that wipes out a whole town in seconds, Wise's movie is a minor sci-fi classic. But since much of the story depends on cutting edge science, the passage of time has not been kind to it. Much of what looked innovative or futuristic in the 1971 version looks rather quaint and dated now. So if the remake could keep the same just-the-facts-ma'am procedural tone that Wise established, and update the science, then it would be quite successful. Unfortunately, the filmmakers chose to go further than that simple improvement, and bit off way more than they could chew. One of the most appealing things in the original version was the dry tone established by casting second-tier actors in the almost anonymous roles of the science team. Little is known of the four clinicians' backstory except what is essential to resolve the plot. That leaves us time to appreciate the painstaking application of the scientific method necessary to solve the rather imminent problem of the virus's potential to decimate mankind. Spookier still is the lack of knowledge on the origins of the virus. The effect is that of being a fly on the wall as the doctors work to contain Andromeda, the name given to the virus. The new movie just tries too hard. The mystery is robbed of the story by giving us too much information, spending way too much time on the rather hokey origins of Andromeda. It also illustrates the destruction of the town of Piedmont, Utah. In the original, the creepiness of the desolate town was inherent in the absence of awareness one had regarding details of it's decimation. The core characters are populated by some appealing actors, including Benjamin Bratt, Christa Miller, Daniel Dae Kim, and Viola Davis. We are privy to each of their background angst, but the fact that it usually involves some cliche doesn't invite one to dwell on it for long. Also the cast has nearly doubled in size, adding an investigative reporter (Eric McCormack), an army General (Andre Braugher), and a military doctor (Ricky Schroder). This seems to be designed to give us additional expendable folks we might identify with before they are cut down in service of the plot. So now, in addition to having to follow the scientists take on Andromeda, we also have the media's and the military's. Rather than enhancing the story it gives short shrift to each of the three parallel plots. Maybe this was an attempt at a backdoor pilot, meant to lead into a series if successful. But between all the cutting back and forth from the military trying to cover-up the incident, to the reporter trying to survive long enough to file his story on the virus, to Bratt's lead scientist confessing his attraction to Miller, his former research associate, the show evokes one of 24'scrazy pre-teaser catch-up montages, more than it does a fully-formed, layered premise. Surprising given that the producers are Ridley and Tony Scott, and the director is Mikael Salomon, who's given us some fine TV work before. By the time you've got Kim slicing off Schroder's thumb and throwing it to Bratt while the three try to shut down a nuclear reactor, you'll be wondering if you didn't switch to one of Jack Bauer's bad days by mistake. The DVD does have some respectable features. It has an informative commentary from the director and producer David W. Zucker. There's also the usual making-of featurette, and a pretty nice gallery of production photos and design drawings, over 100, in fact. None of these address the obvious failings of the film, which usually makes for far better commentaries than the average so-this-is-how-we-got-this-shot stories. Saddled with too much to chew on, The Andromeda Strain's central plot of humans fighting an unknown threat on a scientific playing field is lost. Catch Robert Wise's original version instead, and you'll enjoy its suspenseful execution despite the retro science. This entry first appeared on Blogcritics on 6/7/2008.